1. 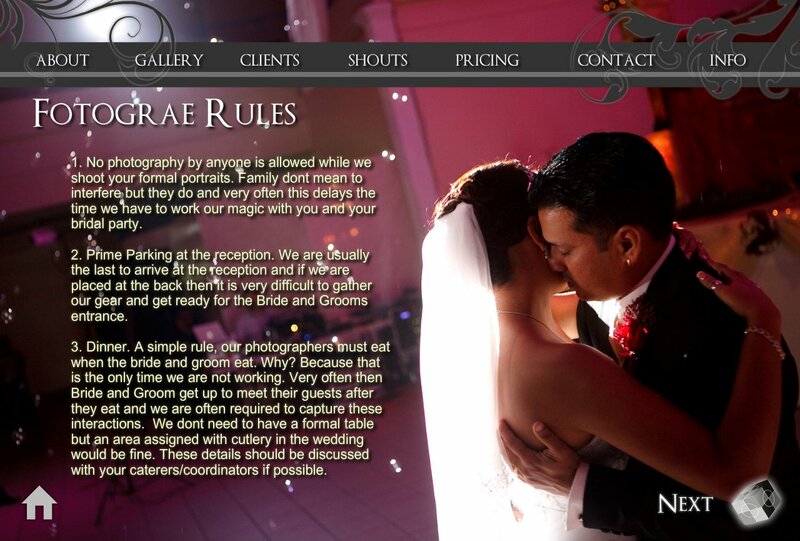 No photography by anyone is allowed while we shoot your formal portraits. Family dont mean to interfere but they do and very often this delays the time we have to work our magic with you and your bridal party. 2. Prime Parking at the reception. We are usually the last to arrive at the reception and if we are placed at the back then it is very difficult to gather our gear and get ready for the Bride and Grooms entrance. 3. Dinner. A simple rule, our photographers must eat when the bride and groom eat. Why? Because that is the only time we are not working. Very often then Bride and Groom get up to meet their guests after they eat and we are often required to capture these interactions. We dont need to have a formal table but an area assigned with cutlery in the wedding would be fine. These details should be discussed with your caterers/coordinators if possible.